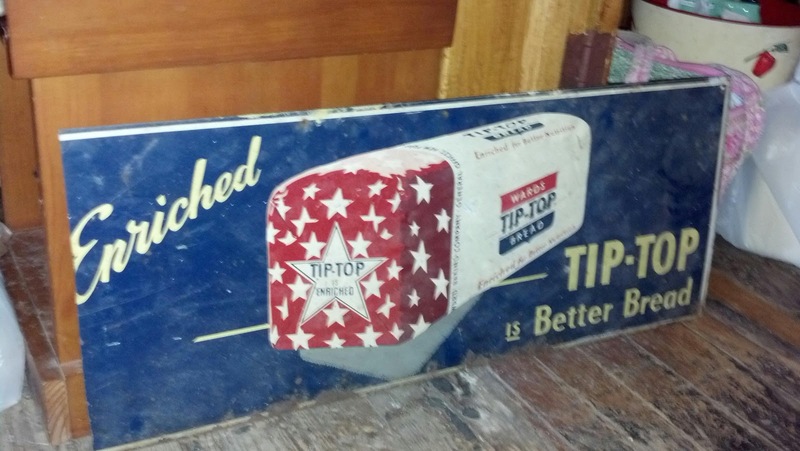 Yesterway: Tip-Top and to the Thrift Shop! The thrifts have been slow around here. Very Slow. Alas, I have thankfully not become discouraged and continue to check frequently, so I have found a few small goodies to share. I've also been hitting the antique stores more frequently. Last week during some mother daughter bonding time, I got to hit up four Goodwill stores as well as two antique stores... normally this would mean a full car...but sadly the quantity wasn't up to par...luckily, I found a few awesome pieces on my wish list. I finally found a complete canister set without any cracks in it, hallelujah! Okay, so it isn't the most beautiful at the moment, but I'm betting a magic eraser and a silver paint pen will really improve them. And if not? Well, the full set was only a dollar so it was worth the gamble. At the same store, I also picked up the Pyrex shaker as well as the turquoise Hamilton Beach Mix Master. The milkshake maker is missing a beater...but luckily i have the exact same one in cream. I've always prefered the turquoise one though, so I figure I'll switch the beater over to it and re-donate the cream one. I picked up the fantastic vintage metal apple trash can at an antique store for $5... I think it's adorable and is already being put to work in my room. But what are those tubey thingys? We have a continuation of the junking experience in my mom's garage before their big move: a vintage metal sign for Tip-Top bread. I love the colors on it and think it will be perfect in my future kitchen. Thanks Mom! Over the weekend, I got to go out for some father-daughter time and talked my dad into hitting an antique store. I was pretty tickled with the few items I had found. 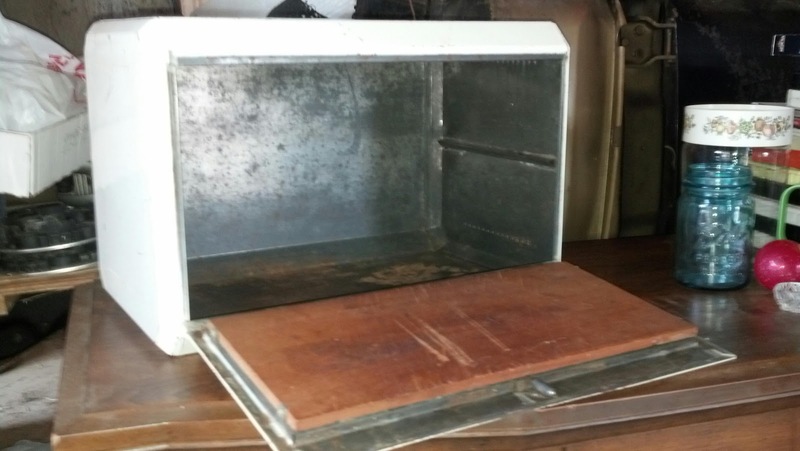 I picked up the metal bread box for $8. Although it is missing the handle, it should be easy enough to fix up. As for the chippy spots? I love them! 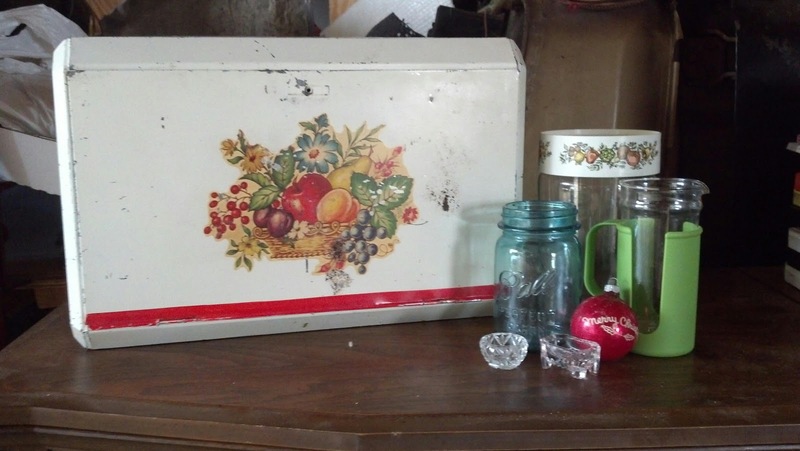 The blue mason jar and "Merry Christmas!" Shiny Brite ornament also came from the same store. The Pyrex See-and-Store canister, two salt dips, and odd green plastic and glass Corning pitcher like creation were gifts from my mom. Does anyone have any additional information on the pitcher? An alternative view of the bread box. Well that's all for now folks, hopefully next week brings some more fruitful thrifting...my wallet can't take the antique stores forever. Hopefully y'all are having some better luck. Linking up at Thriftasaurus, The Nifty Thrifty, Rednesday, and Apron Thrift Girl! Love the test tubes (I would have snatched them up too). 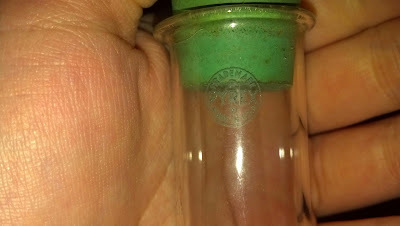 I've seen people make little vases out of them, but I love that yours still have the stoppers. My mom and I also do a lot of mother-daughter bonding at the thrift shops! Thanks for the suggestion Gina! I love thrifting with either of my parents; it gives us some time together, adds some fun to it, and is an extra pair of eyes! Lucky you - what a great sign!! Hope things pick up in the thrifting world, soon!! Thanks Jill! My fingers will certainly be crossed! Love that sign- you're so lucky! And I love that bread box- never seen one with a built in cutting board before. I like the test tubes. I don't really have any suggestions regarding their use, maybe take up a bit of mixology, lol? I would have bought them, too. I like the milkshake mixer, too. I can't find a vintage one. All the ones I spot are remakes from Bed, Bath & Beyond or Homesense. Nothing on the pitcher - sorry! Thanks Sir Thrift-A-Lot! I'm glad I'm not the only one who would have bought the test tubes - despite not having a preplanned use hahaha I'll cross my fingers you come across a milkshake mixer! Thanks Heather! Apparently I'm in a pretty lucky area for those drink mixers, I've found a couple of the white or cream ones...the aqua was a different story though so I'm pretty tickled to find it! You found some great stuff! I love that bread sign. It is just the type of sign that I need to put above my pantry door. 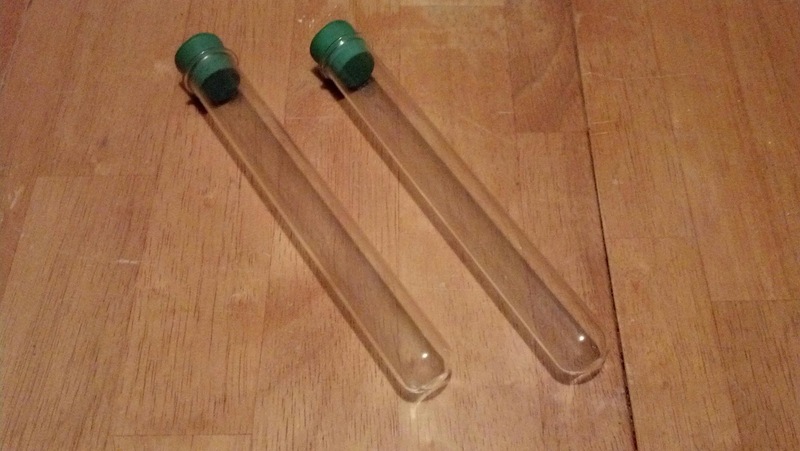 You could use the Pyrex test tubes in your Christmas decor by filing them with glitter. Thanks Erica! I really like the glitter idea with the test tubes, I just may have to see how that looks! Such good finds during the slow season! 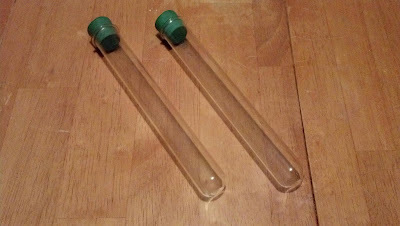 The test tubes would make really cool bud vases, or storage for teeny tiny shells. We can't wait to see what you end up doing! Oh, I love that milkshake maker! We were at an antique store over Christmas and there were 2 different ones and they were $$$! Great find! Thanks Heidi! I really do love it too - especially in that color! If that's when things are slow, I'll be back to see what treasures you get when things are full swings Some great stuff-love the canisters and the test tubes. I'd use them for bud vases in some kind of holder. Thanks! Usually things really pick up for me during the summer, I'm a bit of a flea market addict! You found some really fun vintage treasures. Love the canisters. Thanks Diann! 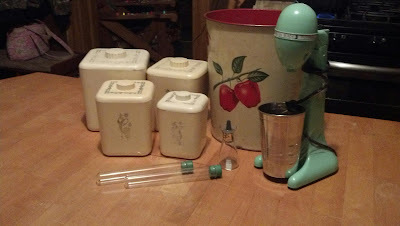 Hopefully those canisters clean up as well as I think, then they'll be an awesome buy for $1! You found some lovely pieces!!! Thanks Wendy! I was pretty tickled!